Truckee defenders gang tackle a South Tahoe player as Vikings supporters look on from the hillside at Surprise Stadium during Truckee's 32-27 win against South Tahoe last year. The Truckee defense continued its stellar play Friday night, dominating Spring Creek in a 33-0 win on the road and securing a first-round bye in the upcoming Class 3A Northern League playoffs. The Wolverines kept the Spartans under 30 yards during the first half as the team jumped out to a 21-0 lead, before tacking on another 12 points in the fourth quarter. Senior quarterback Marcus Bellon surpassed 3,000 career passing on yards on the night, throwing for 238 yards on 14 of 21 attempts. Bellon linked up with senior Drew Wingard for his only touchdown throw of the night, scoring on a 10-yard pass in the second half. Bellon also added the final touchdown on a 10-yard run. Seniors Kevin Malo and Marcus Trotter led the Truckee rushing attack, combining for 120 rushing yards. Trotter also scored two rushing touchdowns and had a team-high 92 receiving yards. Senior Derek Laferriere scored the Wolverines’ other touchdown on the ground. The Spartans threatened to score late in the game, but junior George Skaff preserved Truckee’s shutout with an interception deep in Wolverines territory. Wingard led the defensive effort with 12 tackles (10 unassisted), and a forced fumble. He and Trotter also combined for a sack. Senior Brennen Conklin brought down the Spartans quarterback for a sack as well. The Truckee defense hasn’t allowed a point since the opening drive of last week’s game against Sparks. 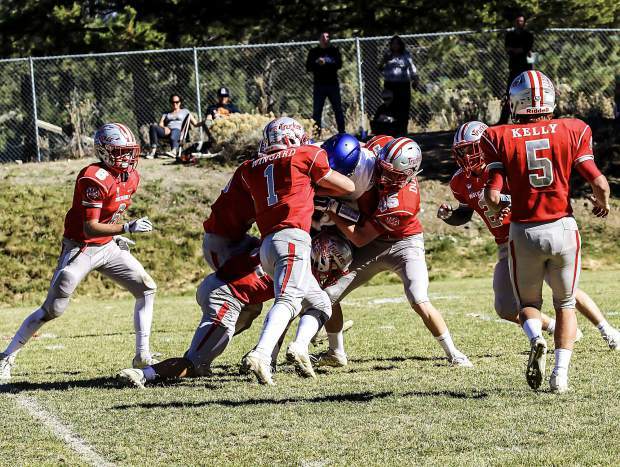 The Wolverines also have shutouts in two of their last three games, and during the team’s current five-game winning streak, Truckee’s defense hasn’t allowed multiple touchdowns from any opponent. Truckee (8-1, 7-1 Northern League) will close the regular season out on the road against South Tahoe (1-8, 1-7 Northern League) at 7 p.m. Friday. The teams close the year out with the annual Sierra Bowl rivalry game. Truckee will look to hang onto the Sierra Bowl trophy for a third consecutive season.